How do you decide what is the most featureless place? The Cambridge dictionary defines featureless as ‘looking the same in every part, usually in a way that most people consider to be boring’. Even the wildest parts of Scotland or the flattest fen in East Anglia have a ditch, bridleway, stream or hill to break the monotony. Over ten years ago a listener to John Peel’s Home Truths show on Radio 4 asked about boring places in Britain. This triggered the search for Britain’s most boring place. The BBC turned to the Ordnance Survey to see if looking at maps would provide the answer on the basis that their large-scale maps show almost all features in the landscape. Maps are divided by grid lines into squares that are a kilometre wide and tall, and features are identified by various symbols. The obvious thing to do therefore was to find the grid square that had the least symbols in it. Was there a completely blank square among the 320,000 squares in the widely-used Landranger map series? This series of maps are at a scale of 1:50,000, that is one centimetre on the map is 50,000 centimetres on the ground, which is half a kilometre. This is how it looks on a map. The blue square in the middle has nothing in it except a single electricity pylon (the v-symbol) and the bit of overhead line between pylons. 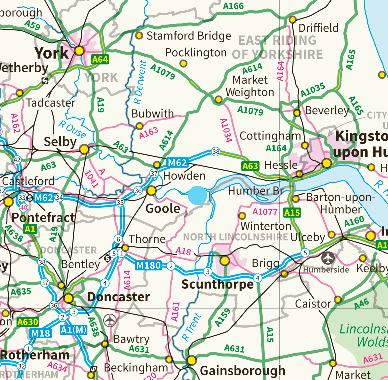 The blue spot in the middle of this map, to the east (right) of Goole, marks the location of Britain’s most featureless place. After setting a computer to look at every one of the squares, the Ordnance Survey came up with answer! A field in the East Riding of Yorkshire is the most featureless place in Britain. 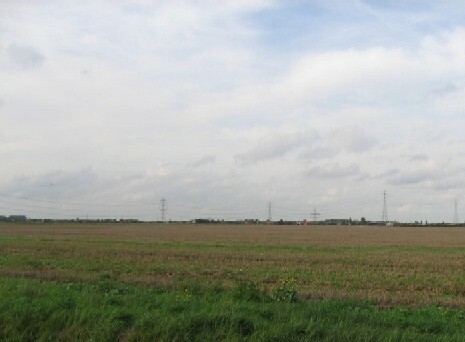 The square kilometre of farmland on the outskirts of the village of Ousefleet, just south of the River Ouse, near Scunthorpe, has nothing in it except a single electricity pylon and some overhanging cable. 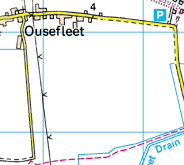 The square at grid reference SE 830 220 (the south-west corner of the square) on OS map 112 is as near as cartographers can get to a completely blank square in the Landranger map series. This is what the most featureless place looks like on the ground. The electricity pylon and the overhead line to the left lie just in the kilometre grid square, and that’s it. The rest is flat farmland. © Roger Gilbertson/Creative Commons Licence.